A question I've had in my head since I first saw screenshots of the display preference pane on the new Retina MBP is this: Can it be made to run with what you could call a 1.0 UI scaling factor (same amount of pixels for the same widget as you'd get on a regular MBP or say, an iMac)? To clarify, the preference pane appears to allow you to select between several predefined scaling factors from "Like 1920x1200" (UI scaling factor = 1.5) through "Like 1440x900" (UI scaling factor = 2.0) to "Like 1024x640" (UI scaling factor = 2.8125) and there is also a radio button for "Best for Retina display". Does this radio button for "Best for Retina display" set the UI scaling to 1.0 or does it simply set the scaling to the "default" 2.0? If the latter, has anyone checked if there's some defaults write com.apple.[...] 1.0 setting available which forces the scaling of the UI to 1.0? SwitchResX: A reasonably simple solution, SwitchResX is a third-party preference panel that allows you to run custom resolutions on any display. 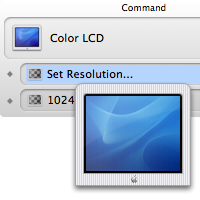 Install the preference panel, select the Retina Display, and add a custom resolution setting for 2880×1800. SetResX: Probably the easiest option of them all, SetResX is a little menu-bar app that allows you to run 2880×1800 easily. scrutil: Slightly more advanced due to the nature of the command line, the free utility called screenutil gets the job done immediately with a quick entry into the Terminal. ChangeResolution: ChangeResolution is a new tiny AppleScript front end to a command line utility that changes the resolution to 2880×1800. Quicksilver can do it also if you enable the Displays plugin. I use it all the time. You can assign triggers to specific resolutions/actions as well. The displays plugin allows Quicksilver to index the displays currently attached to your Mac, in order to set the Desktop picture and their resolution, colour depth and refresh rate. Retina DisplayMenu lets you select specific resolutions (both HiDPI and standard resolutions) and is the app that I currently use. Selected resolution in image above is the Best for Retina resolution. Not the answer you're looking for? Browse other questions tagged lion display macbook . How can I get full resolution on Mac Book Pro Retina? How to run Macbook Pro retina on native resolution? How to set screen resolution with a keyboard shortcut on Retina MBP? Are the Retina MacBook Pro 15" suitable for PC (Windows) gaming? MacBook Pro Retina 15" native resolution compromise?